For the past week, the world's eyes have been transfixed on the United States as Chinese President Xi Jinping conducts his first official state visit to the country. The world's two largest economies are currently at odds on a host of issues, ranging from disputes concerning the South China Sea to cybersecurity. In his new book, The China Mirage: The Hidden History of American Disaster in Asia , James Bradley details the history of U.S. relations with China and argues this isn't the first time the countries have misunderstood one another. The book starts by explaining how the Roosevelt, or Delano, family made its fortune in China. Franklin Delano Roosevelt's (FDR's) grandfather, Warren Delano, was the king of America's opium trade in China dating back to the 1830s. It continues by covering China-U.S. relations from Theodore Roosevelt's presidency all the way to the Viet Nam War in a little under 400 pages. It's a lot of ground to cover, but Bradley writes in a simple, yet engaging, manner that makes the book an easy read. 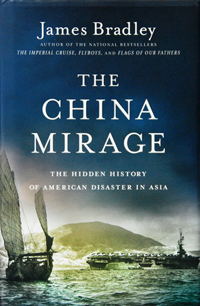 China Mirage 's main purpose is to analyze the United States' relationship with China from the 1830s to 1974, but the majority of the book is devoted to World War II (WWII) and America's decision--or, as Bradley sees it, the manipulation of several men in FDR's government--to cut off Japan's oil supply, thus bringing about the attack on Pearl Harbor and America's involvement in the war. This is understandable, given Bradley's close connection to the war and the fact that he has already written two books on the subject. Bradley's father was one of the men who raised the American flag at Iwo Jima, the subject of Bradley's first and most well-known book, Flags of Our Fathers . Indeed, Bradley was looking for a WWII story when he decided to write China Mirage . "It just struck me that what I read about WWII in the United States I didn't find in China, and what I found in China I didn't find covered in the United States," Bradley said in an interview with Beijing Review . WWII is undoubtedly Bradley's area of expertise, but China Mirage 's focus on U.S.-Japanese wartime relations leaves the reader wanting to know more about China, particularly in light of the book's title. Bradley organizes his tale chronologically, but the end result is he jumps from one event to another, disorienting the reader who quickly loses track of his original train of thought. For example, in one chapter, while detailing the unfreezing of Japanese assets in the United States, Bradley abruptly jumps to Soviet Union officials having a meeting in the White House, only to return to the topic of Japanese assets two paragraphs later. Despite these shortcomings, Bradley addresses some interesting facts not generally touched upon in the American education system. It's often taught that Japan's attack on Pearl Harbor was a totally unwarranted surprise attack. But as Bradley lays out, the United States backed Japan into a corner by cutting off its California oil supply to the Asian country. Japan received the majority its oil and steel from the United States with its only other supplier the Dutch East Indies, or today's Indonesia. FDR staunchly maintained for years that cutting the oil supply would force the United States into fighting a war in the Pacific. But, according to Bradley, an organization called the China Lobby convinced several policy makers and the majority of the American public that Chiang Kai-shek would turn China into a Christianized and Americanized country if he was given supplies and if America would stop supplying Japan. These policy makers did just that when FDR left the United States in August 1941 to meet with British Prime Minister Winston Churchill to discuss the war in Europe. Bradley cites other historians who back his claim that the United States need not have fought a war in the Pacific, such as historian John Toland, who wrote, "America could not throw the weight of her strength against Japan to liberate China, nor had she ever intended to. Her major enemy was Hitler. [The Pacific War was] a war that need not have been fought." Another fact discussed is that Mao Zedong reached out to FDR and his administration in January of 1945 and requested a meeting in Washington. The message, according to Bradley, was intercepted and changed by Chiang Kai-shek's men and later buried in a memo to FDR. Bradley questions what America's relationship with China would be like today had FDR received the invitation, arguing "some still argue that [Mao] was not sincere, but the fact is that Mao made great efforts to reach out to Roosevelt, and it's easy to believe that with Europe and Russia bleeding men and money, he would have loved to be allied with Washington and Wall Street." Overall, China Mirage presents an oversimplified version of history and the latter sections focusing on the Korean and Viet Nam wars leave much to be desired. But the historical tidbits not generally included in public discourse are well worth the read, and it serves as a good introduction to those unfamiliar with America's history in Asia.